Get ready for an action-packed, sun-filled weekend that’s expected to draw more than 75,000 people to Central Ballard. The 44th annual SeafoodFest is back with all the fixings — live music, salmon BBQ, lutefisk eating contest, beer gardens, kids events and more — and for the first time, Viking Days will be held at the same time a few blocks away at the new Nordic Museum. The weather will be quite warm, with the forecast calling for temperatures in the mid-to-upper 80s. The SeafoodFest kicks off tonight (Friday) at 7 p.m. with a concert featuring #All4Doras and Nite Wave near the belltower on Ballard Ave. You’ll see a full beer and cocktail garden as well as food trucks Nosh, Off the Rez, Paella House and Where Ya At Matt. Then on Saturday morning at 9 a.m., the Viking Fun Run gets the day started at the new Nordic Museum (2655 NW Market St.) Participants are encouraged to wear “Norse seafaring attire” (which every true Ballardite has in their closet duh), and prizes will be awarded for time winners and best costumes. You can register right here ($40). SeafoodFest’s big draw is the food, of course. Dozens of food vendors will line Market St. between 20th and 22nd Ave. As always, Trident Seafoods will be BBQing its alder-smoke salmon on 22nd just north of Market. New this year, they’re also offering Penn Cove steamed mussels at the Clam and Mussel Shack along with those king crab legs at the Crab Shack. To pay, buy tokens at the information booth or in the beer garden. One of our favorite annual events is the lutefisk eating contest. This year will be a particularly taxing event for those 10 unlucky participants: they’ll be inhaling that disgusting slimy fish sludge under a hot afternoon sun. The event begins Sunday at 3 p.m. at Bergen Place. The music mainstage is at Ballard Ave. and 22nd, and here’s the music lineup with headliners Blitzen Trapper and All Them Witches on Saturday evening. 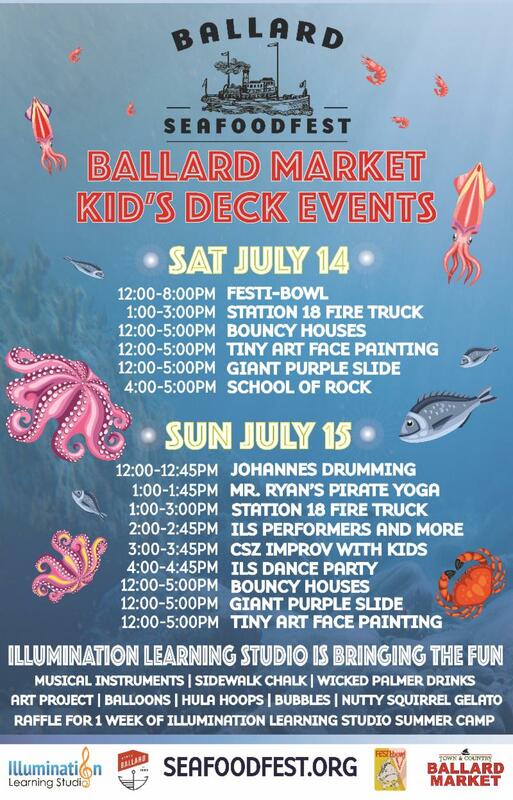 Just south of the mainstage on Ballard Ave. is Game Plank, an activities space featuring the Miss Homestreet Seafair hydroplane on display, aerial performances by Arcadia Seattle, giant Jenga, corn hole, ladder balls, bucket ball, badminton and a doggie splash. On Sunday, this space turns into the Ballard Farmers Market. The arts and crafts booths will be on Market St. to the west of 22nd Ave. and along Leary Way. Up in Ballard Commons Park, you’ll find Kids Deck, which has a packed schedule of events. Seattle Fire’s Engine 18 will be there with bouncy houses, face painting, bubbles and a lot more. Also at Ballard Commons, the skate park turns into Festi-Bowl on Saturday — the largest all-ages skateboarding competition in Seattle. It will also feature clinics, lessons and live music. Wait, there’s more! Viking Days has its own schedule of events from 10 a.m. to 5 p.m. on both Saturday and Sunday — if you have yet to explore the new Nordic museum, now’s your chance. The always-popular Swedish pancake breakfast will be served both days from 10 a.m. to 3 p.m. There’s a full entertainment lineup, plenty of Scandinavian food, crafts, a Viking encampment, kids activities and a beer garden, to boot. It’s not opening until this fall due to permit delays, but the Skål Beer Hall at 5429 Ballard Ave. is holding a sneak peek during SeafoodFest. Doors will be open Saturday from 12-4 p.m. and Sunday from 11 a.m. to 2 p.m.
Old Ballard Liquor Co. will be hosting its annual food booth, Tumble Swede, with Scandinavian sandwiches “alongside a brand new treat special for this year: lobster tail corndogs!” Oh my. The booth will be located on Market Street, in front of Camera Tech and Lil’ Woody’s. The Salmon Bay Eagles are hosting an open house membership drive on Saturday to coincide with SeafoodFest. “The community is encouraged to come on down during the fest and enjoy drink specials on the patio and free live music later on in the evening.” Kids are welcome. Located on 20th Ave. between Russell and Leary. Is there anything we’re missing? Feel free to add in comments, and have fun out there! Let’s keep these comments specifically about this event. Specifically, I’d like to know how many homeless will ransack this event. The comments were actually stolen by tweaker hobos and sold for scrap. Can you please repost them? Soooo, it must be free this weekend? That’ll make it worth walking down there in this weather. Free is pretty much what it’s worth. Good to know, Lambchop. My husband is good at snagging free museum tickets from the library, so I think we’ll wait until he does. I went to Seafoodfest last year, nothing special, for me it is an every 4 year event and then I wonder why I went. If you do go this weekend walk or bike as parking is always a challenge. You should contact the Leif Erikson lodge #2 of the sons of Norway. They are having a rummage sale in the lodge in Ballard. I don’t have the phone or address and as I just spent @ couple of days abusing my bod with carpentry tools and wood it is too much effort for me to go to the computer to look up phone and address. Leif Erickson Hall is on NW57 th just at the other end from the Ballard Commons. Just google Leif Erickson Lodge #2 Seattle and you should get the info you need. Norwegians are a little bit slow sometimes – I know because I are one. Sum of us kan’t Wright or spel too good because we had mrs Mitchell for English and she absolutely fauned over the jocks and ignored cellophane men like me. Nothing like seeing a Packers fan destroying Vikings! This fest is beyond stupid. I’ve been to more interesting state fairs in Iowa. Fish! The organizers didn’t even offer any freebies to the locals for inconveniencing them with noise, crowds, and traffic. Oh neat, truck food at 20% higher than normal. Typical cheap, inconsiderate, exploitative Seattle crap. What sort of freebies would you want? The point is, they never thought to offer any, which seems rather inconsiderate due to the disruption. I’ve lived in Seattle far too long to expect any better. To many, that whole “leave no trace” philosophy only applies to hiking trails not neighbors. Certainly the soda cracker sized crab melt with a hint of crab was a rip off. OK. Let’s talk about a gazillion people flocking to Ballard and what that brings: last year I witnessed sooooooo many drivers diverting off of 65th, continuing their speeds up my the street. I simply can’t be the only person seeing this and getting pissed. Why do so many feel it’s OK to scream through neighborhoods to get to this thing? Want to park in front of YOUR home this weekend? Tough. Too bad for you. I guess all these hipsters forgot to ride THEIR bikes or take the bus here. Sad they missed that memo. Although, this is a good shot at comparing tattoos and your dogs. My tattooed dog wants to give you the kisses. Ballard smells like dog excrement but that was funny. Fact: hipster women treat dogs better than those evil, planet destroying men who do things like keep the streets paved and erect these festivals at night and unload the trucks. It sounds like the men are pretty busy. Maybe that’s why they aren’t treating their dogs as nicely? Like everything has become around Seattle, it is just too congested to be able to relax and enjoy anymore. Waiting for a seat in the beer garden takes longer than waiting in line for a buffet on Mother’s Day. The hand made items, like the beach glass jewelry and a wood worker or two were nice to see, but between windspinners made in China and ReachNow’s propaganda booth, I think that I will mosey over to the U-District Farmers Market and take in some local stuff. The food is more interesting this year with some better bar-b-ques and ethnic trucks. The girls are just as pretty, Vikings and all. To be fair it’s not just Ballard or Seafood Fest. The entire city is generic today. It seems to be what people want. Over the hill and far away. See you there. So much fun and amazing food. Really enjoyed it. Irvrin Adams is a lead way to various hacking exploration and I am the master in charge and with me everything is possible, my job is with 100% guarantee and the security of my client is my upmost priority.